YOU ARE HERE 2012- THE CLIPS! You Are Here is the most fun I’ve ever had. You Are Here is the best team I’ve ever worked with. You Are Here is the least sleep I ever get. You Are Here is the most successful thing I’ve ever been a part of. Canberra has spoken. They like the festival. They want the festival. Every other terrifying aspect of administration and funding and risk management strategies and insurance can now be worked out on that basis. Please enjoy the above video, which only skirts the surface of our 11-day, 120-event Artsplosion. Also be enjoying this bonus video of one of my personal Babies, Mixtape From Canberra. All credit to our You Are Here Media Team and the Artists who made it all happen. After writing a few episodes for my cousin/writing partner Jason McGrath’s show Crooks, I decided to strike out on my own. The Real is a sitcom set in a suburban real estate agency. It’s been likened to Parks And Recreation, and that gives you a good idea of its format and tone. I’ve written two full episodes, a season outline, and a synopsis. But with no contacts in the industry, that’s as far as it’s gone. Through Jason, it’s passed under the eyes of a couple of producers, who were interested but have remained non-committal. I attended SPAA Fringe last year, but mainly met other writers and directors (which, to be honest, was mega-fun). Everyone had a pitch or a story and was looking to take the next step. Most were a few steps ahead of me, having either produced short films and/or worked on features. It was a good introduction to what little industry Australia has, but I didn’t come away certain what to do next. If there was a take-home message, it was if you want to get something out there, make it yourself. After Heartbroken Assassin, we now have the confidence to do exactly that. 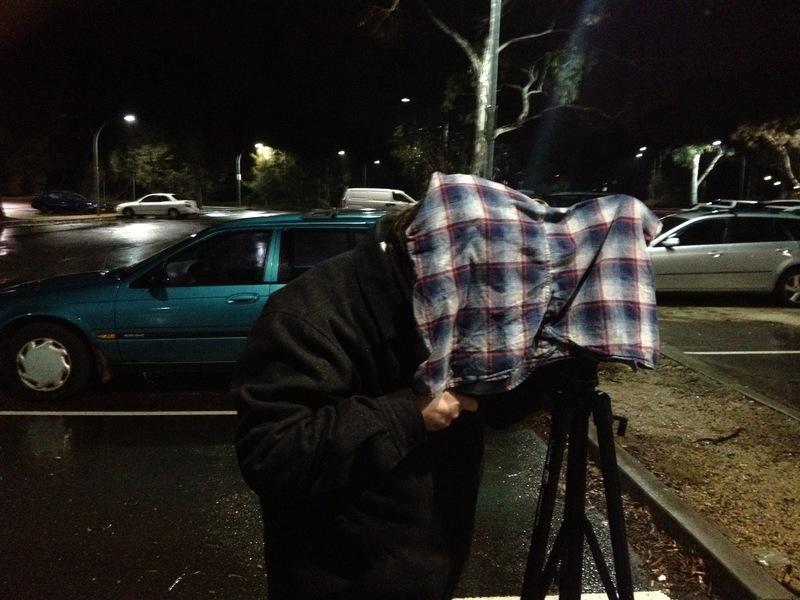 Nick and I are shooting the pilot episode as a ‘proof of concept’. Which is to say, I don’t yet know whether it will be the final iteration, or solely used as a tool (like a script) to get meetings with production companies and networks. Either way, having it shot will both demonstrate the show’s viability, and also our abilities as a writing/directing/production team. Australia’s track record with sitcoms is not great, but with funny, clever shows like Please Like Me on the air, I feel we’re turning a corner. I’d love to see The Real be a part of that. We’re currently locking in the script, before looking to casting and locations. Exciting times. I’ve cut together a video of the Shine Tarts performance last month. It combines excerpts of Sunshine Sally, alongside footage taken by Louise McGrath and Erica Hurrell. On the night, the music acted as embellishment to the film. In the video, I’ve reversed that and put the emphasis on the musicians – the film is only seen in part (not always enough to follow the story) and now serves to enhance the music. When Andrew Galan approached me and suggested filming something together, it felt like kismet – Lou and I had talked ages ago about getting some poets for The Slimer Sessions. He had a clear idea of what he wanted, and brought in Fuzzsucker to bring it to life. To say more would spoil the video. With Fuzzsucker slated to take part, we arranged to film them as well. Davey brought along a completed track he wanted to lipsynch to, and we quickly decided it’d be more fun to shoot an actual film clip. Three takes and we were done. Davey already looks like a rock star, but in lipstick and a dress, he became an errant New York Doll. 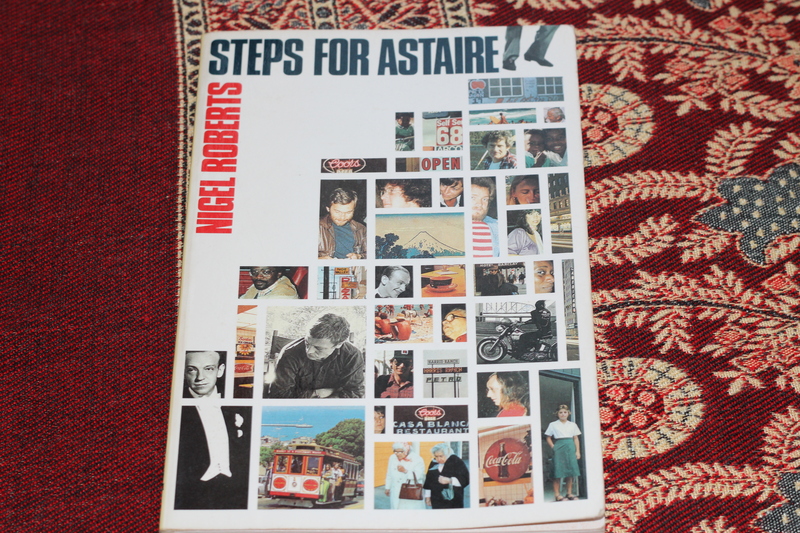 I recently re-read Nigel Roberts’ Steps for Astaire for the umpteenth time. Ten years ago, I picked it up at a used bookstore. I hadn’t written a poem in years, dumping Poetry for its hot cousin Songwriting. As a teenager, I wrote a lot of them – so many that I won my high school’s Creative Writer Award for my “body of work”. 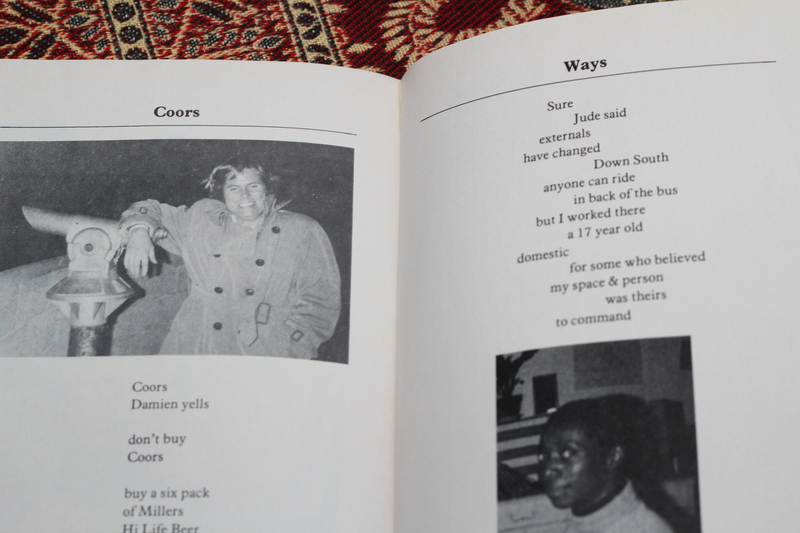 Like most teen poets, I took my craft seriously – poetry was for revealing how deeply you felt and thought about things, especially the kinds of things ordinary people ignore. I actually had a poem called Confessions Of A Wooden Chair. I didn’t feel that deeply about much of anything (let alone chairs), but since that’s what I thought poetry was about, that’s what I tried to do. That, and making pretty words rhyme. Rimbaud, I was not. Steps for Astaire got me excited about poetry again. It was a light-bulb moment – here was poetry that had depth, but was also funny, conversational, clever, relatable and real. Poems about pineapple douche and hash, about oddballs and dogshit, about free jazz and gallery sandwiches. Bukowski is a similar revelation for many, but I was yet to come across his stuff. It didn’t matter anyway – from that point on, Nigel Roberts was my man. His poems are longer than haikus but have the same laser-beam focus – a moment or feeling captured in as few words as possible. Zero padding – they get in, say what they need to, and get out. Some of them aren’t more than, “hey I was sitting with a friend and they said this funny thing”. Anecdotes as poems. Reader and poet as co-conspirators, as friends. He’d be brilliant on Twitter. His sly humour got me where I live – it’s adult and juvenile at the same time. Most of his poems are properly funny, with actual punchlines. He builds to them like a classic stand-up would – setting the scene, luring you in, and then whacking you over the head. They’re also frequently self-referential, postmodern in how they constantly remind you that you’re reading a poem. All these qualities had a profound impact on me. Over the next couple of years, I wrote a book of poetry (or a bunch of poems I thought held together as a book), adhering closely to the School of Nigel Roberts. Very closely. Maybe even closer than I realised at the time. Compare the following examples (Roberts’ is second). Everyone starts by imitating someone else. I stopped writing poems shortly afterwards, so my ‘poet voice’ is suspended forever echoing Nigel Roberts. I can live with that; a lot of what I learnt – economy of words, pacing, a well-placed gag – filtered into my songs and other writing. I like a few other poets, the same ones as everyone else – Larkin, Dickinson, Ginsberg – but I don’t actively seek them out. The exception is Roberts – I check for his works in every bookstore I enter. I’ve never seen another copy of Steps for Astaire. 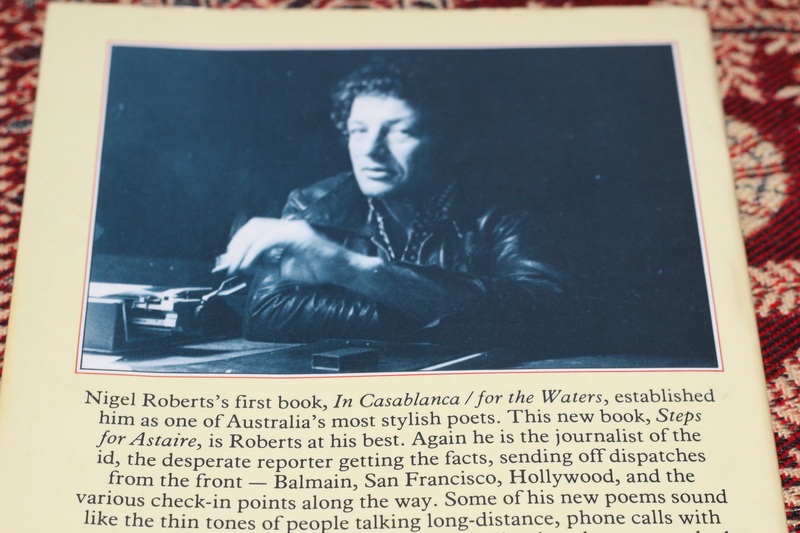 His first book Casablanca / for the Waters is my Holy Grail. It got so bad, my need so dire, that years ago I went to the National Library and photocopied it in its entirety. This had one advantage over actually finding the book – I could blu-tac my favourites to the walls. A cult movie, or album, or poet, is fun. It’s cool to have that thing that marks you out as clued-in, but also bonds you with others. I don’t need Nigel Roberts to be the biggest poet in the world, but I’ve never met anyone that’s heard of him. There’s a little about him online these days, but information is scarce. If you’re a fan, reach out.